the exact opposite happens (revel is fine but tests fail). Is there a way to correctly reference the file so that it works both for tests and normal program run? This is not the problem with path, but the problem with your design. You should design your code more careful. As far as I can tell, you share same path in your test file and reveal run. I guess that maybe you hard code your json path in your model package which is not suggested. model package get json path from global config, or init model with json path like model := NewModel(config_path). so reveal run can init model with any json you want. Relative paths are always interpreted / resolved to a base path: the current or working directory - therefore it will always have its limitations. If you can live with always taking care of the proper working directory, you may keep using relative paths. What I would suggest is to not rely on the working directory, but an explicitly specified base path. This may have a default value hard-coded in your application (which may be the working directory as well), and you should provide several ways to override its value. 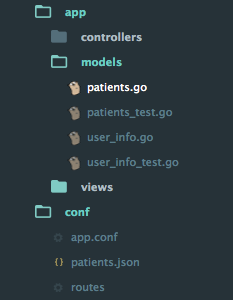 full := filepath.Join(base, relf) // full will be "/var/myapp/conf/patients.json"
is there a way to know the path of the .go file? On Linux, if /proc is mounted, it's possible to know the location of the program being executed by calling os.Readlink() on the symlink named "/proc/self/exe". In either case, it's a) not portable; b) may have little sense anyway as a properly packaged software package for a GNU/Linux-based system should have its binaries and "assets" separated anyway. I'd mention another possibility as well: 1) have a global variable defining the base directory prefix for the assets, say, main.AssetsDir; 2) allow downstream packagers override it at build time using the linker's ability to override string-typed values, like with: go build -ldflags="-X main.AssetsDir=/usr/share/cool_app/assets". The OP could get more background on this by studying the outputs of go help build and go tool link -h.
@kostix Good idea, but that limits the configurability to developers. Users without programming knowledge would find command line flags much friendlier and easier to use than build flags.